GSH Industries is an innovator when it comes to custom injection molding. We own 15 injection molding machines ranging from 75 to 1,500 tons to produce high-quality plastic injection molding solutions. Please call GSH Industries today for quality control assurance and excellentcustomer service. The GSH team can’t wait to help you! Headquartered in Holland, Ohio, ICOMold manufactures low-cost, high-quality custom plastic injection molding for customers around the world. We provide prototype and low-volume plastic injection molding, export molding, and production molding with a lifetime warranty. Get a fast online quote for your next plastic injection molding project. Here at MSI Mold, our injection molding equipment features the latest technology, which ensures consistency and repeatability in our products. Our state-of-the-art equipment also allows for variety in adding various colors and platings to your product. For more in-depth information about the injection molding process and how we can make your desired design a reality, contact us today! We are the experts in plastic injection molding and have been since 1984. We started small, but today, we have a large customer base around the world. We believe that our attention to quality and our outstanding customer service has made us into the company we are today. Whether you are a first time customer or a long-term customer, we give you the same attention. Contact us today! If you are looking for plastic injection molding then turn to Molded Devices, Inc. Our products are designed for accuracy and high efficiency. Our teams are very creative and we work with you every step of the way. We offer quick turnaround and we are a very reliable manufacturer who will work with you every step of the way. 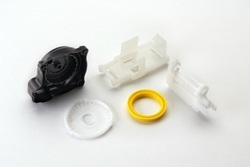 Plastic injection molding is the most common manufacturing technique in the modern world of manufacturing, and is used for products that we use in our everyday lives, such as bottle caps, children’s toys, and automotive dashboards. In the process of plastic injection molding, molten plastic is injected into a mold machine and is then solidified. 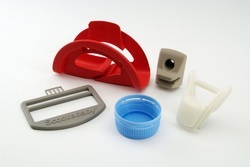 Almost any plastic product can be made using a plastic injection mold. The typical layout of a plastic injection molding machine consists of a hopper, which is a chamber in which the plastic pellets, or granules, are placed in preparation for heating. The next vital component is the heating chamber, where the pellets are melted down. In its molten state, other substances such as dyes or other chemical agents can be added in order to change the final product’s color and texture. The injection mold consists of two hollow cavities which clamp together under pressure. The cavities are injected with the molten plastic, are joined together, and left for a short amount of time to cool and solidify. Once solid, the two halves of the mold are separated, and the plastic product is ejected out of the mold by a set of ejector rods or pins. Speed. Plastic injection molding is popular for long manufacturing runs because of its speed. The speed ultimately depends on the complexity of the product, but the downtime in between cycles generally lasts less than a minute. In addition to how fast the molding process itself is, the final product often times is finished as soon as it leaves the mold, and does not need to undergo any additional processes such as surface finishing. Low labor costs. Most injection molding machines feature automated mechanisms that keep production going at a steady rate. Because so much of the machine is automated, they require little supervision. Accuracy. The injection molding process involves filling a mold that is cut with the utmost precision. The structure of the molds as well as the pressure applied in the process ensure that there is very little variation in the product’s configuration from copy to copy. Strength. Some injection molds feature fillers that reduce the plastic’s density during molding, and even after molding. In applications that require their plastic components to be exceptionally strong, plastic molding has strengthening capabilities that other processes do not. Complexity capabilities and versatility. Since the injection molds undergo such high volumes of pressure, the molten plastic presses harder against the mold. As a result, the design of the part can feature highly intricate details. It is simple to change not only the type of material used to fabricate the products, but the additional chemicals that change the products appearance. Plastic injection molding machines can also be designed with co-injection molding capabilities. In other words, these machines can handle more than one material at a time. Minimal waste. The process of injection molding is highly energy-efficient. Although the final product may include a joining line where the two halves of the mold cavity meet, the total amount of wasted plastic is very minimal and can be easily removed during the finishing process. The small amount of plastic waste that the process may produce can be recycled and reused. In addition, another advantage to the plastic injection molding process is the broad range of materials that can be used. The choice of material typically depends on the intended purpose of the product. Thermoplastics are a common material that is used, because of its ability to become malleable once heated and rigid once it is cooled. Other materials that are used are thermosets and elastomers such as rubber. As beneficial as the plastic injection molding process is, it is not perfect. One disadvantage that comes with injection molding is the initial cost of the equipment. However, once the machinery is established and the mold is created, both will last a long time and be able to produce plastic components at a cost-efficient rate. Injection molding has many advantages that far outweigh its drawbacks, and is considered a worthy and beneficial long term investment by manufacturers worldwide.